* Honey is the main top note. * Caramel comes in, along with chocolate and an earthy patchouli. * Sometimes I get an odd coconut note during this phase, other times I don’t. * The chocolate and patchouli recede into the background of the base when a creamy vanilla takes the focus. Summary: People know me for wearing loud fragrances and many people ask me what I have on. This is one of the few scents that I’ve worn where people will tell me what I am wearing.. Angel. Seriously, at least 5 people have said they thought I was wearing Angel when I had this on. I get the association, but to me this would be more like Angel Intial (in the Guerlain sense) or Angel Light. It is not as brazen or in your face as Angel, but it definitely makes it presence known. What impresses me is how thick and heavy the notes should be – chocolate, honey, caramel – but they all feel light and airy. As an eau de parfum, it has great longevity with it lasting through a work day and into the evening – it is office-friendly. Its probably too sweet for most guys, but they should still give a try. You can get a full bottle for $25 on Amazon, so it’s a cheap thrill – so if you want something sweet with no guilty feelings – give Vanille Chocolat a sniff. 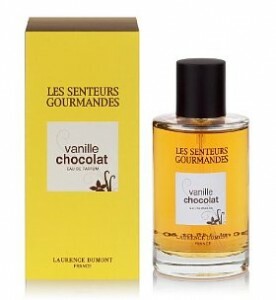 Les Senteurs Gourmandes Vanille Chocolat is available at Amazon. Disclaimer: No disclaimer needed as I own a full bottle. Image courtesy of Marks and Spencer website. Though not one for sweet scents generally, I’ve been rather impressed by this range, which is now carried extensively by a leading chain in the UK. I particularly like the patchouli, but then I guess that some of us are made that way. As for this being an ‘Angel Initial’ you’re spot on! It might even be ‘Angel Initial L’Eau’! !